Yesterday was time for another trip to the North Shore of Massachusetts. I went back to explore Cape Ann for some location scouting. Cape Ann is growing into one of my favorite photography hot spots in New England; it is beautiful during all seasons, has a wonderful seashore with lots of picturesque harbors and cozy towns. I visited Gloucester, passed through Rockport and then continued north along the coast and finally ended up on Crane Beach near Ipswich. On the way I came across Lanes Cove and stopped because of a flock of Mallard ducks that were hovering and comforting each other from the bitter cold. During my first attempt to capture the flock I unfortunately scared them away. I think I approached them to fast or came to close for their comfort which made me feel bad; they have enough stress and did not need the extra dose from an insensitive photographer. Shame on me ... should have used a longer lens! 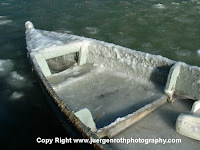 On my way back to the car I discovered an ice covered dinghy that previously went unnoticed. It was rocking in the partly frozen waters of Lanes Cove. What a treasure! I worked with the object for quite some time and once satisfied I turned away to hit the road. Well, not that easy ... some of the Mallard ducks had returned. 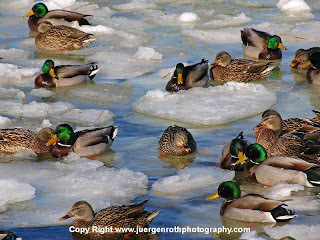 Others were still making their way in lanes through the ice, one always leading. I decided to give it another try but this time being more cautious and anxious for their well being. I changed from a 200 mm to a 300 mm lens and then carefully approached the flock. Once I got a few shots in I carefully and slowly moved the tripod and camera a step closer and so fourth. When I finally got my shots I moved slowly backwards and returned to my original purpose of scouting Cape Ann which led me to Crane beach at the end of my trip.